The mechanized musician finally makes his playable debut next week, as Big Band will release for the PS3 version of Skullgirls Encore. Big Band. On PSN in North and South America on 4/22. He's coming. 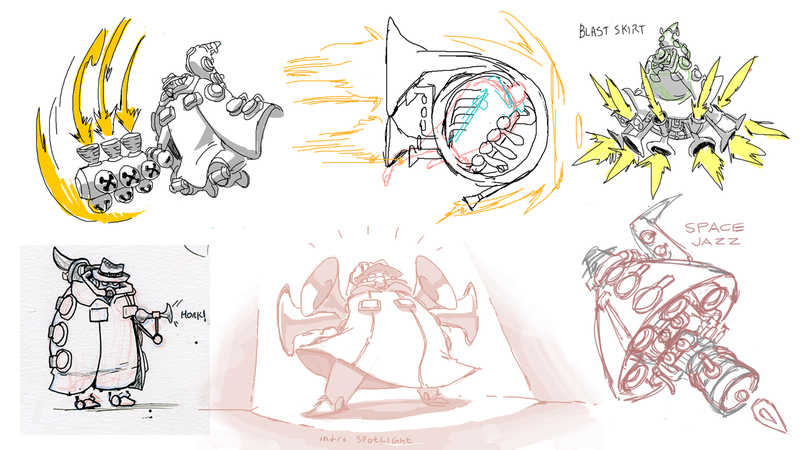 As Skullgirls Encore first released for PC, Big Band will also make his official debut for the PC version on 4/22. If his arrival is the same as Squigly’s, then Big Band should be made available through a Steam update. Whoops! We meant "Big Band would be out for the PC version" on 4/22. Obviously, the PC version is already out. 😛 Sorry for the confusion! As promised through the IndieGoGo campaign, all DLC will be free upon release for a brief period of time. Big Band is the 2nd of five DLC characters funded by the “Keep Skullgirls Growing!” crowd-funding campaign; Squigly is currently available, with future characters being Eliza, Beowulf and Robo-Fortune. Due to the immense amount of positive feedback regarding the April Fool’s Day character “Fukua“, Lab Zero has confirmed that she will eventually become a new DLC character for all versions of Encore. Until her character is balanced and reworked for the official game, Fukua will remain as a playable character in the Endless Beta on PC.